One of the biggest names in hot rod Mustangs is Saleen Automobiles. By offering high performance, turnkey sports cars, the company has transitioned from a garage bay tuner to a highly respected, OEM-level manufacturer. As 1 of only 239 hatchback Saleens produced for the 1987 model year, Saleen #261 is a fine example of the firm's focus and exclusivity. Fully documented with original paperwork including window sticker bill of sale, binder 3" thick with cars history and owners. Outfitted with one of the most cohesive performance packages the '80s had to offer, and sporting a mere 65,124 miles, this Saleen is quite possibly the premier car of its era. If you're a savvy collector looking for a future collectible that's fun to drive and cool to show, there's no time like the present! This particular Saleen drives great, shifts smooths, stops on a dime, and has all the right subtle upgrades. At his core, Steve Saleen is a racer. That's probably why he was one of the first aftermarket tuners to apply major aerodynamic principles to factory production cars. Finished in silky Black, and striped in tri-tone Grey, #87-0261 incorporates every trick Saleen knew right into its boxed body. Originally delivered to Burch Ford in LA, California, this black oval bombshell has been pampered and loved since the day it was new. And the car's great fit and finish is, no doubt, thanks to the largely hand-built nature of Saleen's custom add-ons. 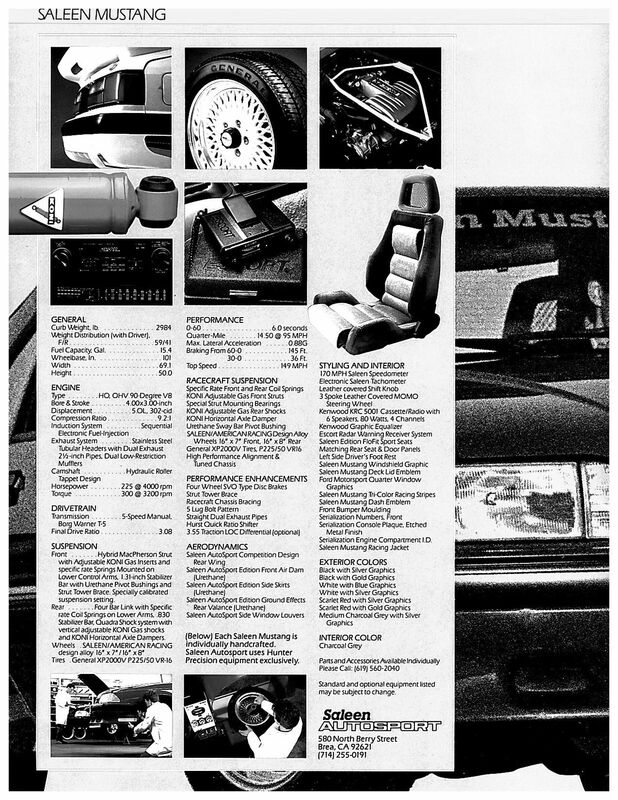 Those features begin with a numbered Saleen Autosport valance, which balances large headlights at the sides of a petite, "Ford" branded grille. At the sides of the car, Saleen Autosport rockers reflect painted mirrors and small door handles. Above those handles, an original top shades an original Saleen windshield banner. And at the back of the car, a small Saleen emblem joins an original Courtesy Ford badge to split the difference between a Saleen Autosport wing and a second Saleen Autosport valance.